Labour and the coalition have blamed each other for failings at 11 hospital trusts with high death rates which have been placed in special measures. The action, recommended in an official review, comes after a leading health research group said its warnings had been ignored for a decade. 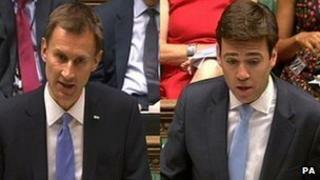 Health Secretary Jeremy Hunt accused Labour of doing too little in power, and of issuing "shameful denials". But his Labour shadow, Andy Burnham, said Mr Hunt was "playing politics". The heated exchanges in the House of Commons followed an investigation of 14 trusts with high death rates in 2010-11 and 2011-12, led by NHS England medical director Prof Sir Bruce Keogh. It focused on whether the figures indicated sustained failings in the quality of care and treatment. The review found problems including poor maintenance of operating theatres. backlogs in complaints, low levels of clinical cover and overworked staff. The government placed 11 trusts in special measures after the findings were published. Sir Brian Jarman, of the Dr Foster research group, which has pioneered the use of NHS mortality data, said his warnings over the past decade and longer over high hospital mortality rates had been ignored. One of the contributors to the Keogh review, he told the BBC it was "very good news that something is about to be done". In the Commons, Mr Hunt argued that problems had begun under Labour, which was in power until 2010, and that it had tried to "muzzle" NHS whistle-blowers. He said: "If founding the NHS is considered Labour's proudest achievement, today is their darkest moment as a Labour government is exposed as caring more about its own reputation than our most vulnerable citizens in the NHS." Mr Burnham hit back, accusing the health secretary of "playing politics with people's lives". However, Mr Hunt said the government deserved praise for commissioning the report following the scandal of neglect seen at Stafford Hospital. Looking at Mr Burnham, he added: "It's not party political to highlight poor care. It is doing the right thing for patients. "You talk about spin. I will tell you who had to fight hardest - it was the whistle-blowers you tried to shut up." Mr Hunt also said: "What is unbelievable are not just coasting hospitals but a Labour Party that has coasted for too long on its reputation on the NHS." But Mr Burnham, who was health secretary in the last year of Gordon Brown's government, told Mr Hunt: "This report is about your government and failings happening now on this government's watch. "Anyone who supports the NHS must always be prepared to shine a spotlight on its failings so it can face up to them and improve." Speaking on BBC Breakfast, Mr Burnham said suggestions that he had ignored warnings about death rates while in government were "utterly false". The 11 trusts in special measures are: North Cumbria University Hospitals NHS Trust, Northern Lincolnshire and Goole Hospitals NHS Foundation Trust, Tameside Hospital NHS Foundation Trust, United Lincolnshire Hospitals NHS Trust, Basildon and Thurrock University Hospitals NHS Foundation Trust, Burton Hospitals NHS Foundation Trust, East Lancashire Hospitals NHS Trust, George Eliot Hospital NHS Trust, Sherwood Forest Hospitals NHS Foundation Trust, Buckinghamshire Healthcare NHS Trust, Medway NHS Foundation Trust. The other three investigated are: Blackpool Teaching Hospitals NHS Foundation Trust, The Dudley Group NHS Foundation Trust and Colchester Hospital University NHS Foundation Trust.